Millions of children are affected by bullies each year. Advances in social media, email, instant messaging, and cell phones, however, have moved bullying from a schoolyard fear to a constant threat. 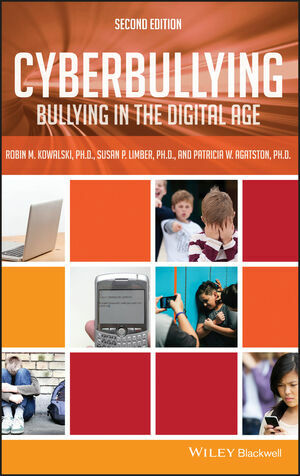 The second edition of Cyberbullying offers the most current information on this constantly-evolving issue and outlines the unique concerns and challenges it raises for children, parents, and educators. Authored by psychologists who are internationally recognized as experts in this field, the text uses the latest research in this area to provide an updated, reliable text ideal for parents and educators concerned about the cyberbullying phenomenon. Robin M. Kowalski, Ph.D., is Professor of Psychology at Clemson University. She is the author or coauthor of several books including Complaining, Teasing, and Other Annoying Behaviors (2003), Social Anxiety (1997), Aversive Interpersonal Behaviors (1997), Behaving Badly (2001), and The Social Psychology of Emotional and Behavioral Problems (2000). Susan P. Limber, Ph.D., is the Dan Olweus Professor at the Institute on Family and Neighborhood Life and Professor of Psychology at Clemson University. She has published numerous articles on the topic of bullying. In 2004 she received the American Psychological Association's Early Career Award for Psychology in the Public Interest. Patricia W. Agatston, Ph.D., is a Licensed Professional Counselor and Prevention Specialist with the Cobb County School District's Prevention/Intervention Center in Marietta, Georgia. She was a participant in the CDC's Expert Panel on Electronic Media and Youth Violence, and has presented nationally and internationally on cyberbullying.